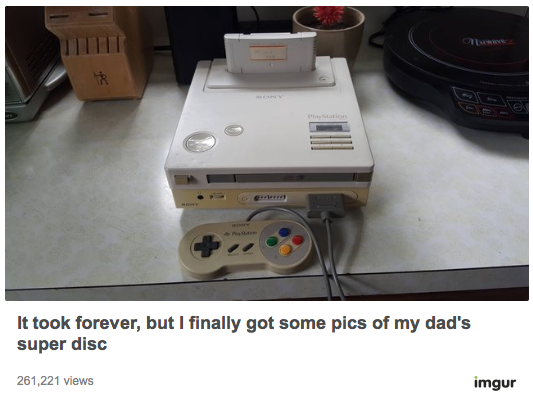 VIA: People were excited when a slew of images hit the web showing what was possibly an official (and very rare) version of the original Playstation created by Sony and Nintendo. It’s sort of a classic piece of mad science, meshing the classic look of Nintendo’s Super Nintendo with the branding of Sony’s now flagship console. At the Consumer Electronics Show in 1991, Sony showcased its Nintendo-endorsed vision for a SNES-CD, which it branded with a “PlayStation” logo. Nintendo shocked Sony, however, by suddenly announcing–at the same show–that it would be partnering with electronics firm Phillips instead. Incensed and embarrassed, the Sony executive Ken Kutaragi began to internally lobby the company to fund plans to build a console without Nintendo’s support. The outcome of that plan, also called the PlayStation, brought about a tectonic power-shift in the games business. This prototype model was found by the son of a businessman who had ties with a former Sony executive, believed to be Olafur Olafsson, who was the chief executive of Sony Interactive Entertainment in 1991. The video above serves as more proof that the console is the real deal and not some knockoff. It’s also in fairly good shape save for the yellow coloring and old appearances. It doesn’t matter how well you take care of these things, they always seem to acquire the same drabby effect of time. The man in the video is apparently set on powering the thing up at some point, but it remains to be seen if it will work. A museum would be the best bet at some point, but for now it’s just hanging out with this guy.